Transform a plain wood item into a colorful item with a personal touch. Welcome to Club Creative Studio’s blog with the focus on creativity. I am adding a few posts about using your creativity in a crunch-time situation. It is that time of year that many stress about the time that they do not have to be creative for the holidays. Maybe it is a lack of innovation of gift-giving ideas, maybe it is the stress of the challenge to do something new and creative in decorating, baking, cooking or gift-giving or gift wrapping. Whatever the creative challenge, here is another post for a suggestion to use your creativity in a quick and easy project. It doesn’t take as long as you think it does to be creative with acrylic paints. You can transform a wood item into a colorful work of original art with a bit of paint and patience. While there is a time and a place to appreciate wood for its natural beauty, some items just lend themselves to adding paint to beautify a wooden item in a different way. Today, I painted a wooden nut cracker home accessory and changed the appearance from plain to wild, crazy, festive and colorful. It is easy to transform a wooden holiday accessory into a more decorative item. The first step is to find an item or ornament made from wood that is smooth and ready to accept paint. I applied a thin layer of gesso acrylic primer to my wooden nut cracker item. I applied one layer of gesso to prime the surface. Using acrylic paint, I applied my paint to the wood figure with ideas to make it a “non-traditional” looking item. I wanted my nut cracker to be bright and colorful, with pattern added after the larger areas were painted for a unique look. When you see the finished product at the end of this post, I think you may agree that the mission was accomplished. Painted item ready for the next step. The next step is adding the details. I love defining areas and adding details with black as a sharp contrasting color. To add detail to the finished painted portions, I used a black felt permanent marker to add my swirls and decorative detailed areas. Adding pattern with my marker seemed to make this item even more fanciful and imaginative. A light coating can be added as a final touch for gloss or a matt protective coating if desired. I hope that if you challenge yourself to create a painted wooden project, you can be expressive and end up with a one-of-a-kind festive item. My finished project! The details make a polished look in the completed art. 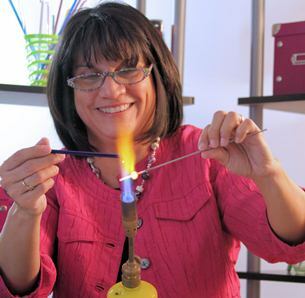 Although I love creating in clay and glass creations like the hand-made art you find in the Club Creative Studio website (http://www.clubcreativestudio.com) I have another love for using paint, especially acrylic. I love that this medium has an easy clean-up process and you can mix your own colors with ease. The fast dry-time is also a plus for getting your project done if you feel the holiday crunch for time. Club Creative Studio shares tidbits of information with a focus on creativity. Today, I combine the usual Thursday TNT (This-N-That) post with the Feature Friday post. Dealing with simple elements found commonly in the home and those that are also low-cost are opportunities to welcome and express creativity. Can you consider a simple string or strand of fiber as a creative starting point? Here are some ideas how you can do this. The only part that is as challenging as the actual project is the dare to try at least one of the activities and report back to this site to share your experience. Happy Creating! 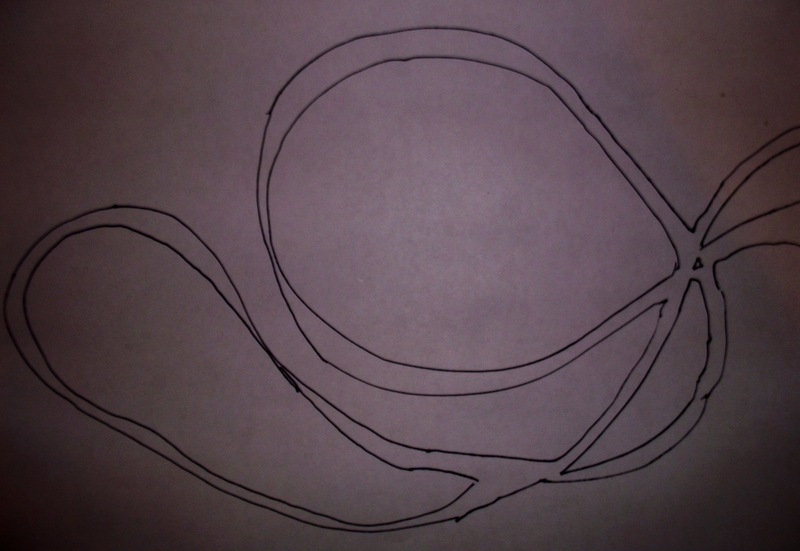 Just as this art suggests can you “see” that simple lines can be creative? It’s fantastic art, MASS MoCA. 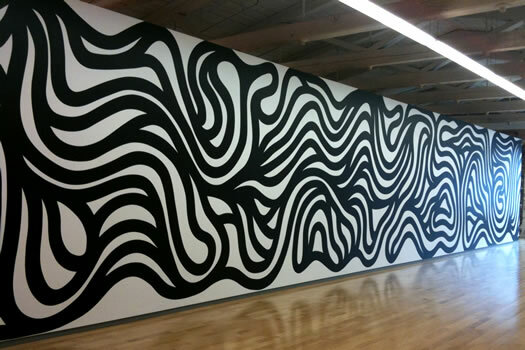 This is a big indoor space that Sol LeWitt made instructions for people to draw on the walls. With a similar concept but on a much smaller scale try this simple activity. You will need paper, pencil and a string of some sort. I suggest a shoe-lace, strand of yarn, thick string or medium thickness ribbon, or a flexible cord will also work fine. Placing your paper down on a flat surface, take the string of choice and drop it carefully on and around the paper. Without consciously arranging the strand you can create a design that is just as interesting as one that you have thought-out for placement. 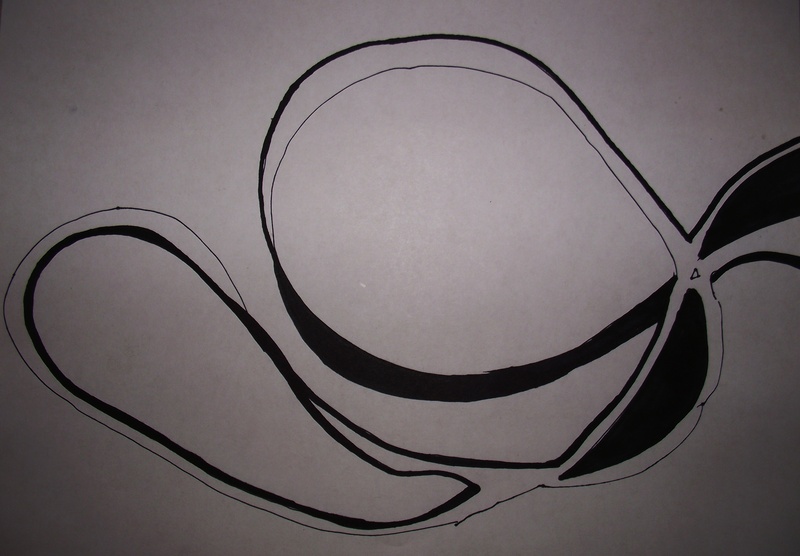 You may need to hold down the material flat so that you can now trace around. Use your pencil to trace around that line. You can appreciate the new form drawn or take this a step further, adding areas of thickness, and changing the design slightly but also adding interest. 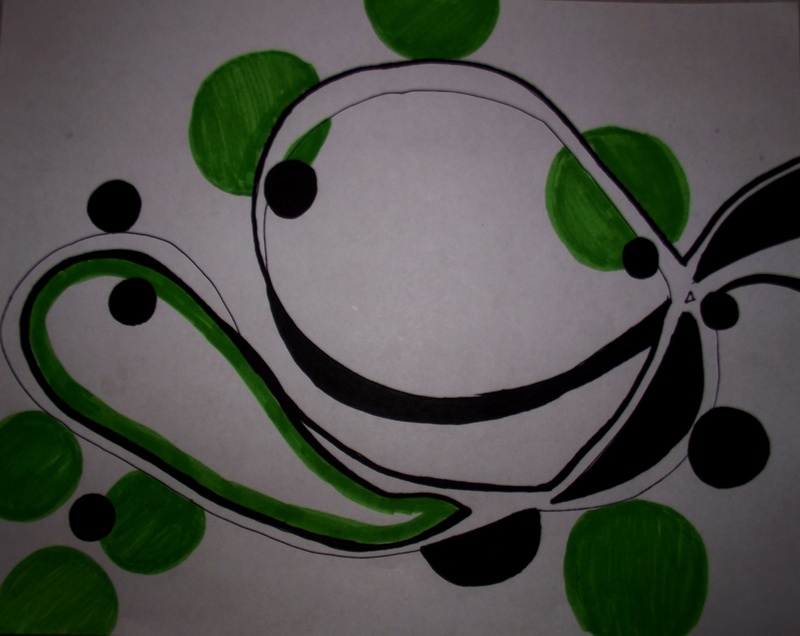 Stop there or continue with a third step and fill in areas with color, pattern or thickness with a marker. You can repeat process for more layered and overlapping lines. If you are trying this project with a small child, allow them to do the string placement and you can be the main person to trace around the string. The idea here is to create and appreciate a simple line and create a new and interesting over-all design. Final Project. Are you inspired to try it? Another activity you can do with a single string is to “paint” with it. Dipping a string in paint, while you hold one end of the string you can then pull and drag the string with paint on it across paper. When you overlap lines, you create an interesting trail. Not too sure about having your little one play so freely with paint? How about trying this with lunch or dinner left-overs? Pasta sauce would be a great contrasting “paint” on white paper and the “brush” could be a single strand of cooked spaghetti! While you are happily trying one of these new string theme projects, I will be stringing along beads. Both of us will have heart-strings attached to our projects. Here is a “Sneak -Peek” exclusive of one of the latest strings that has captured my heart. I look forward knowing how you have been creative today. I welcome your comments! Club Creative Studio Art. Necklace contains hand- made, hand-rolled clay beads, acrylic beads and metal findings. Club Creative Studio likes to reserve the Tuesday post for low-cost creative projects. Today’s Two-Cent Tuesday post is another way to use your stored up creativity in a low-cost manner. Decorating can be costly but, there are ways to avoid that if you use your imagination. This is a fun project with low-cost factors. Among the many types of individuals that are penny-pinching these days are the many college bound and college dorm resident students. You don’t have to be among is category to celebrate your creativity in this suggested project but, it is an ideal solution to decorating and personalizing your dormitory walls, or any wall. 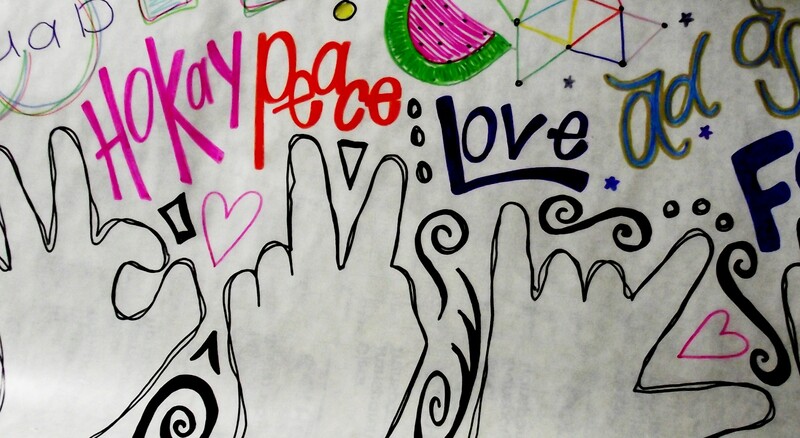 Turn your doodles into art. This post will feature the art of my daughter and her project intended to decorate and place her mark and personality upon her walls of her future living space. 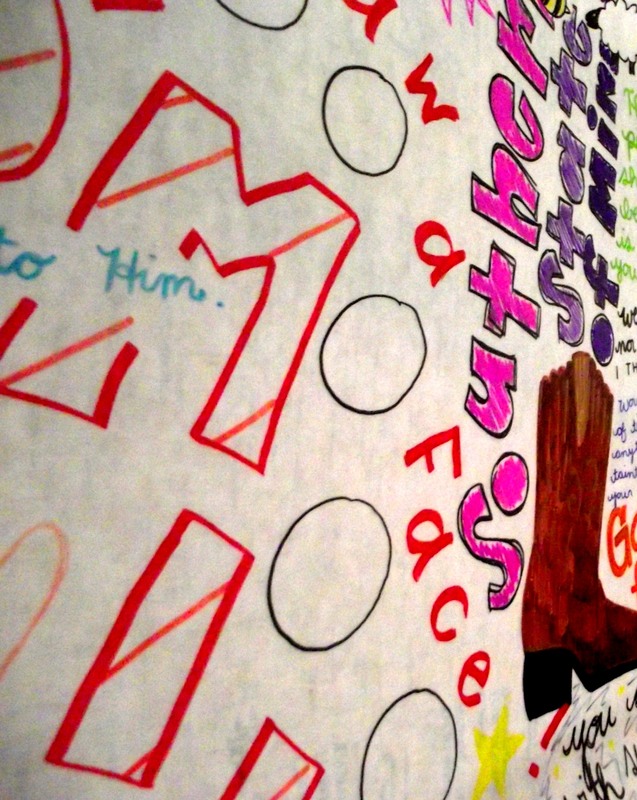 Last year she had a focus on using post it notes to decorate her plain white walls of her dorm. This year her space will be colorful and personal as well. She is using clear contact paper as her medium. This sticky on one side only plastic is low-cost at less than six dollars for a roll of transparent Contact brand paper. She also used her colorful Sharpie brand permanent markers. It would be helpful to also use a flat long surface to work on. My daughter used clear Con-Tact Brand in this decorative project. To begin, gather your Sharpie brand markers, they work best because they are colorful and adhere nicely to the slick surface of the Con-Tact paper. You may wish to use additional paper underneath the ends of the paper so that the markers do not damage your work surface. Sharpie brand markers are permanent markers. 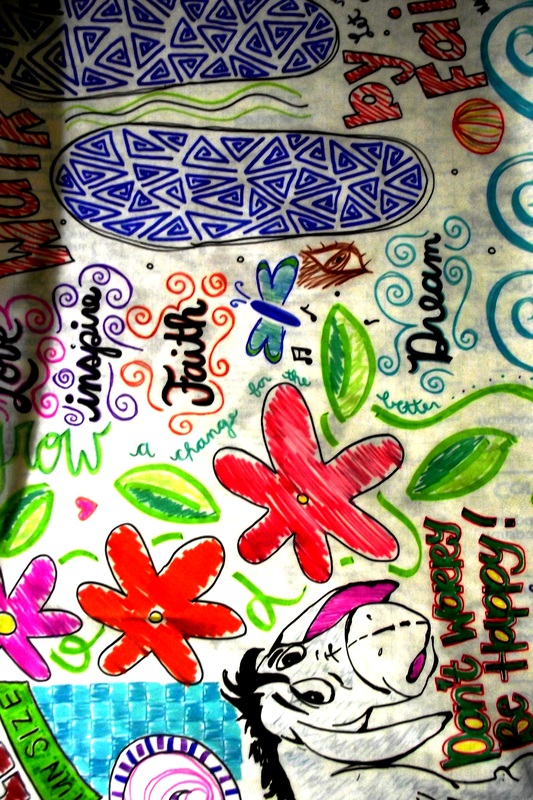 Unroll and begin at one end of the paper and start your decorative doodles. You can letter quotes, draw illustrations, write down positive affirmations and mantras and stick photos or cut outs under a section of the clear paper. Whatever you put on or under your sheet of paper will show up nicely through the transparent and protective adhesive plastic sheet. 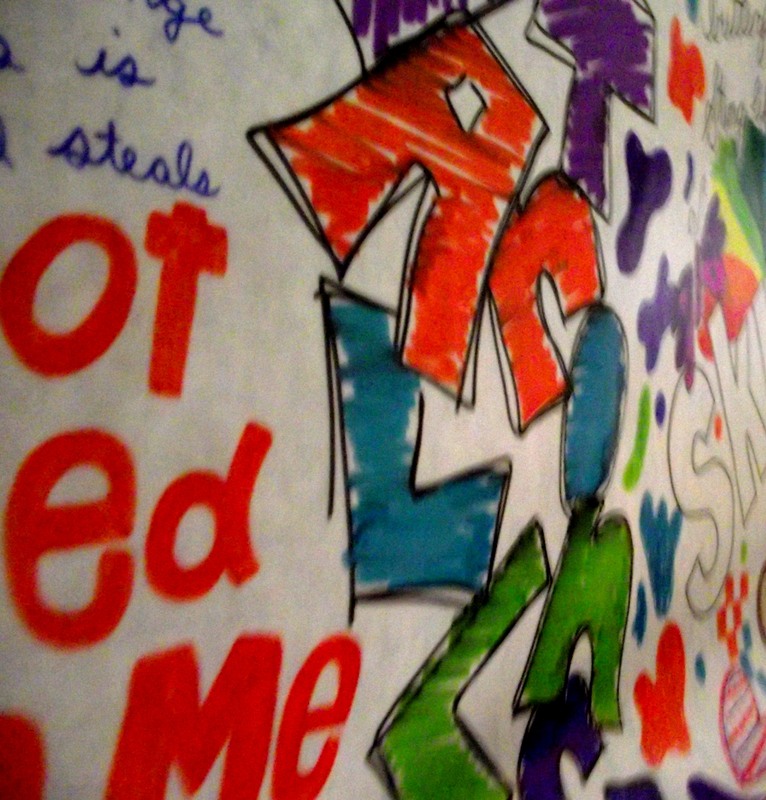 A section of my daughter’s wall art project. Consider your designs to coordinate with the color of your wall. It took a while to add to the entire roll. So you may want to do this project as a group art project or invest time if you do this as an individual. My daughter intends to use her entire decorated roll as a wall border. She will place it as a wide strip across her focal wall at eye-level to add a splash of color to her over-all decorated wall. If there is additional left over after fitting to the space she wants covered, she was thinking of also placing a strip or sections onto her floor. 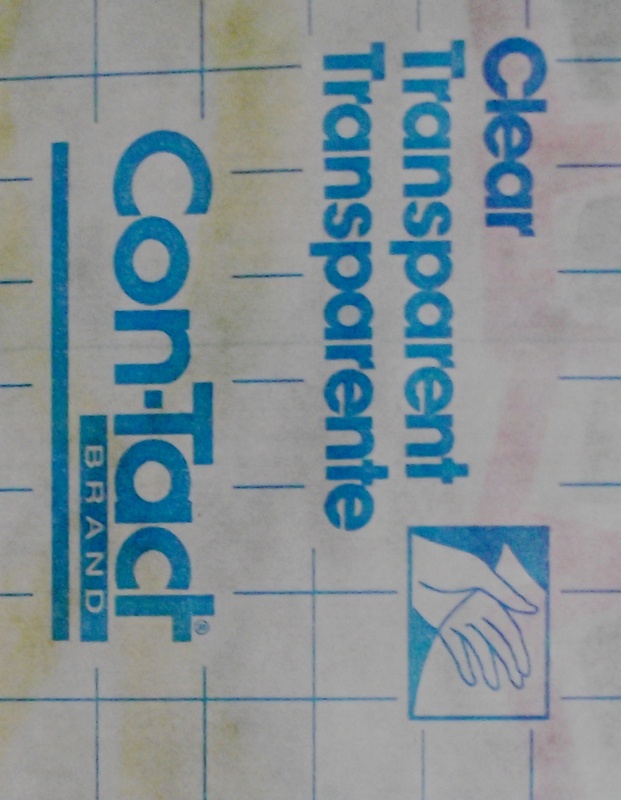 Con-Tact paper will be easily removed later and can be used on many type of surfaces safely. She has used it on her mirrors to decorate the corners of them, on her desk-top to decorate that work space, on cabinets as cut-outs like decals or stickers would be used and she has also used this method of decorating on her windows. A whole lovely theme could be incorporated with this very low-cost method. Best of all, when removed, you can change out your theme or decorative written focus. In this section: My daughter incorporated ovals as “fill-in-the-blanks” for others to add their “two-cents” to her wall mural creation. This self-adhesive is a little tricky to apply alone if you use a whole sheet, so have some help on hand when applying. Make sure that you have an idea of the total length you wish to cover, do some measuring or cutting. apply to a clean, smooth surface. You can use a squeegee or wall paper smoothing tool to aid in getting bubbles out of paper when you flatten it to the wall. Your hands rubbing across the surface will do well enough however, if you take the application process slowly. It is NOT recommended to apply to wood or any water-based paint unless it is given a coat of varnish or shellac because it will stick and be removed with residue from this type wall. Test the wall if you have concerns. For best results in application, the manufacturer of Con-Tact suggests that the surface be above 55 degrees farenheit or 13 degrees celsius for best results. They also mention that some shrinkage may occur so overlapping can be done. This is also helpful to do if you are concerned about edges being touched or rubbed. Draw directly on the Con-Tact paper to create your unique designs. When you peel off the backing, you want to try to do this evenly. For covering a wall which is a very large section, it is best to have help and peel small sections. We will be doing this together in a few weeks so I will be sure to blog about how this turns out at a later date. For now, I’d also like to share that one technique of application could be to begin at the middle (center) of your wall and press outwards towards the edge. You may also use a ruler or cloth to smooth out the bubbles that may form when applying. We like this material because it can be lifted to reposition easily and get out any wrinkles that are formed. It is fun to see your wall “come to life” with your art. I can hardly wait to see what my daughter’s art looks like up on her wall. This material is plastic so you should be aware that pulling too hard will stretch and distort your paper and in turn your images. 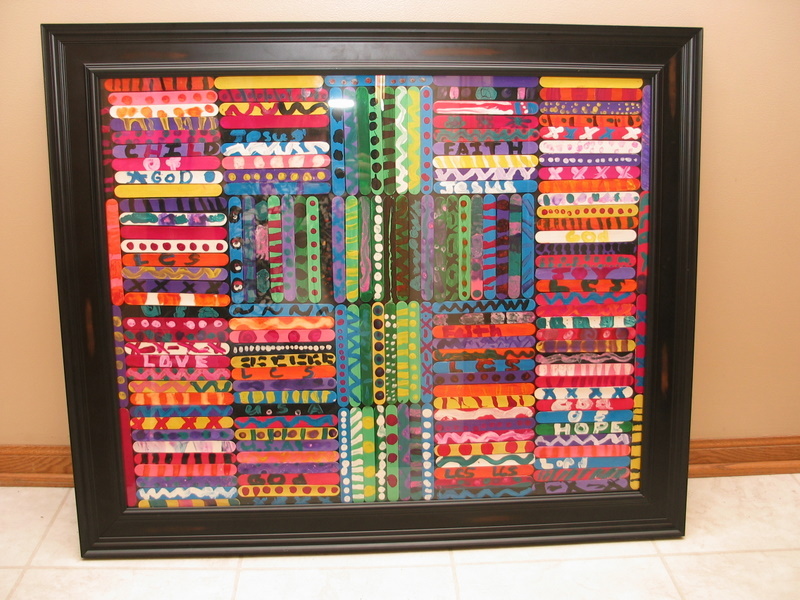 Use care to place your finished project on the wall of other surface you wish to adorn. If you are planning to cut your paper at any point, it is nice to also know that the back of Con-Tact brand paper they have pre-marked straight lines to follow to ensure a straight cut, they have also marked with measurements, so that is such a handy-dandy element to help you adhere and alter your paper art. Make your banner art as long or as short as you wish. Be sure to visit the blog again in the near future to see how her project looks in her living space. I’d also love to hear if you try this method of low-cost decorating yourself. Good luck and happy creating. We are CREATIVE EVERY DAY and hope that you experience fun as you attempt this project sometime yourself. 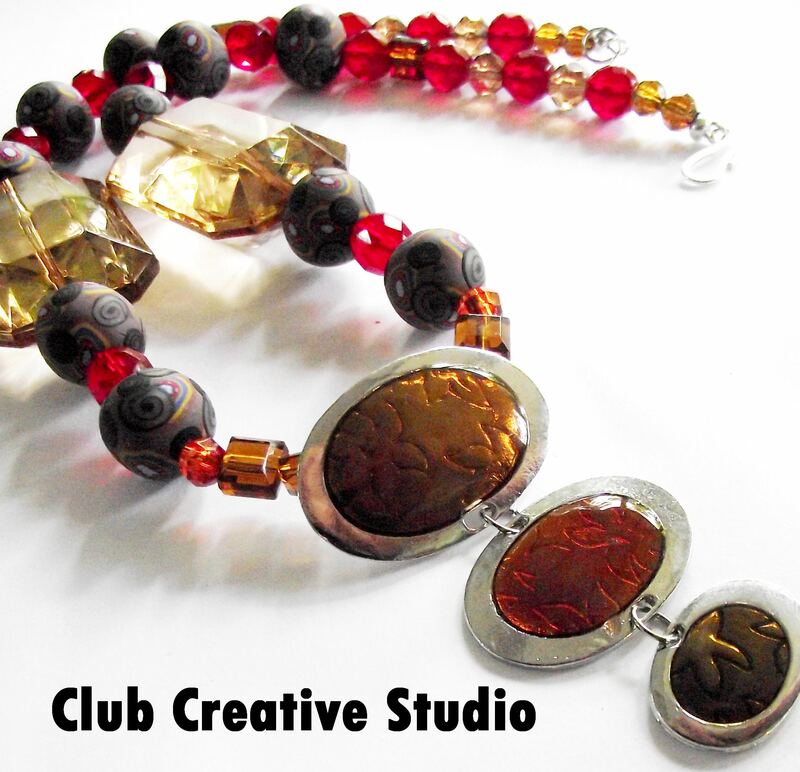 Club Creative Studio encourages creativity. Today, my reason for writing is to share information on a project with a focus on the medium called resin. I have a handful of friends that I am now lovingly referring to them as CRAFTease members. You have perhaps heard of the enduring term: Foodie, an informal term used for a particular class of aficionado of food and drink. Likewise, I may have coined this term today: CRAFTease. The name I give to those I think are interested in “crafts” and have the willingness to learn from what a new product has to offer in being tempted/teased with the desire to experiment more with that unfamiliar art product. Also as a play on words “ease” found in CRAFTease, brings to mind that the examples and artful expressions of ideas created by a CRAFTease flow with ease. With this blog post I am once again highlighting the creative sparks that come from a scenario of creative minds meshing. How do you foster the creative juices of others? The answer is simply encouragement. Encouraging creativity and sharing art and information is one way to pass along the excitement of art. 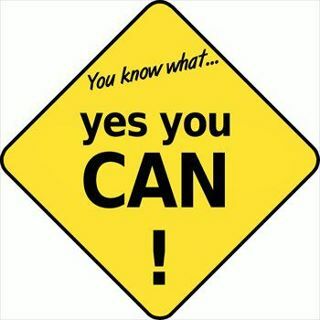 The finest gift you can give anyone is encouragement. and the world would produce abundance beyond the wildest dreams. Before I highlight the post title, I wish to share a little more background information on this group project activity. Last year, Gayle just wanted to gather some of her creative-type friends for a group project/gift giving activity. Gayle arranged to have a handful of her pals meet up at her home to brainstorm and share their talents together in a group art project. It was a meeting-of-the-minds of sorts. 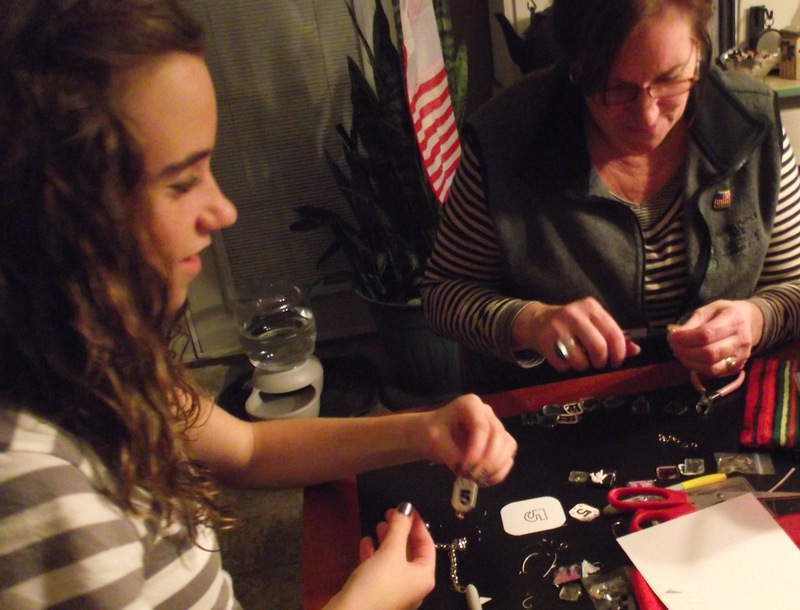 The holiday season last December 2011, seemed to be the perfect time to come together in spirit, create a hand-made charm and share it in friendship. Combined efforts of art were exchanged within the group, everyone left with a memorable keepsake of what each person hand-made individually. 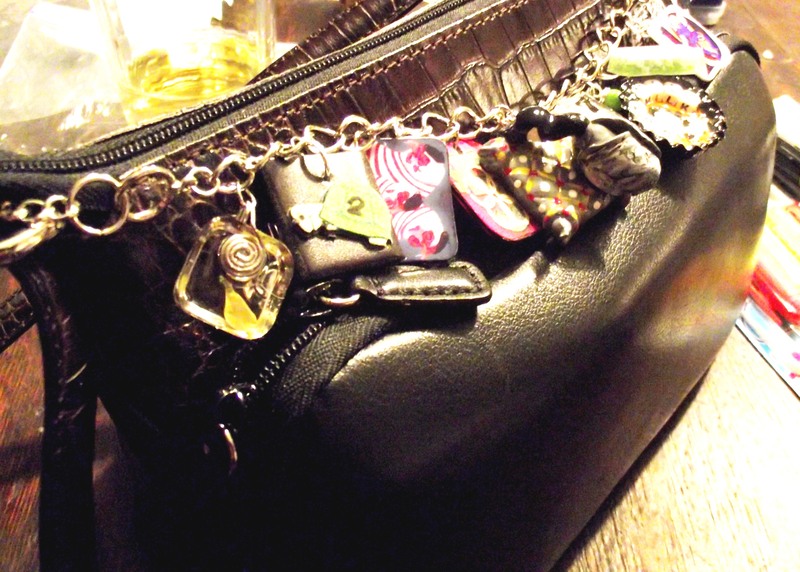 Collectively, the art was “charming”, hand-made charms for us to add to our own link bracelet. The theme: The Twelve Days of Christmas. The opportunity that brought both fundamentals and fun to the table sparked me to ask if we might want to do this type activity again… in February, to celebrate Valentine’s Day. Needless to say we all agreed that we would want to discover or perfect another medium and share the outcome with the group members once again. We decided to all focus on the same medium this time and approach our projects individually under that same theme and medium, resin. Resin is known as any variety of substances obtained from the gum or sap of some trees and often used in varnishes, plastics, and even medicine, and as a comparable synthetic product. Resins we will be using are valued for their chemical/synthetic properties and associated use of a thick liquid that is hardened into a transparent solid. The word “resin” has been applied in the modern world to nearly any component of a liquid that will set into a hard lacquer or enamel-type finish. Our charm examples that we will experiment with are an expression of a modern product which is an epoxy resin. It is known as a “resin” because it will solidify in the same way as (some) plant resins do. Synthetic resins are liquid of thermosetting plastics and do not derive from plants. Our reason for resin is to experience its apparent diversity in casting, layering, embedding , filling and coating. I will be happy to post our results. We are meeting soon to try out our luck. I am ready with the camera to share what we do as a CRAFTease member. Please check back for more information on how we used our resin during the month of February. F.Y.I. The English word RESIN originates from the late 14th century Old French resine. Holiday bracelet made from several collaborating friends. This post brings to light a fun idea that can be transferred to any holiday celebration or life event with a theme in mind, and a few supplies. This post also fits into the TNT (this-n-that) theme. Being creative might be easy for some yet for others it may seem to take extra effort. No matter if creativity is instant or requires planning, it can be…shared. Sharing creativity gives you an opportunity to use your skills and display your talents. This post highlights the efforts of many creative persons. This time, the focus is on a group of persons and a special project. I’d like to reflect on a recent holiday project that was based on the Christmas carol song: The Twelve Days of Christmas. “The Twelve Days of Christmas” is a cumulative song, meaning that each verse is built on top of the previous verses. There are twelve verses, each describing a gift given by “my true love” on one of the twelve days of Christmas. Using this song as inspiration, a group of nearly twelve members created hand-made charms, then gathered for the “big reveal” which included sharing the creative process and exchanging their charms within the group so that each walked away with a unique jewelry keepsake. Some group members collected their charms for a bracelet. 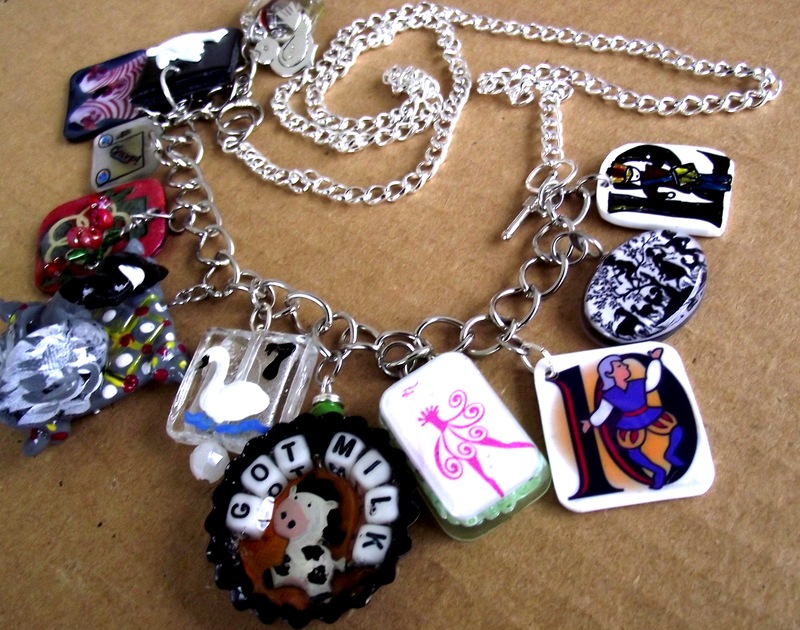 I incorporated my charms into a necklace. The group agreed that this experience was worth repeating and they enjoyed the learning process as much as the expression of creativity. Some group members collected their charms for a bracelet. 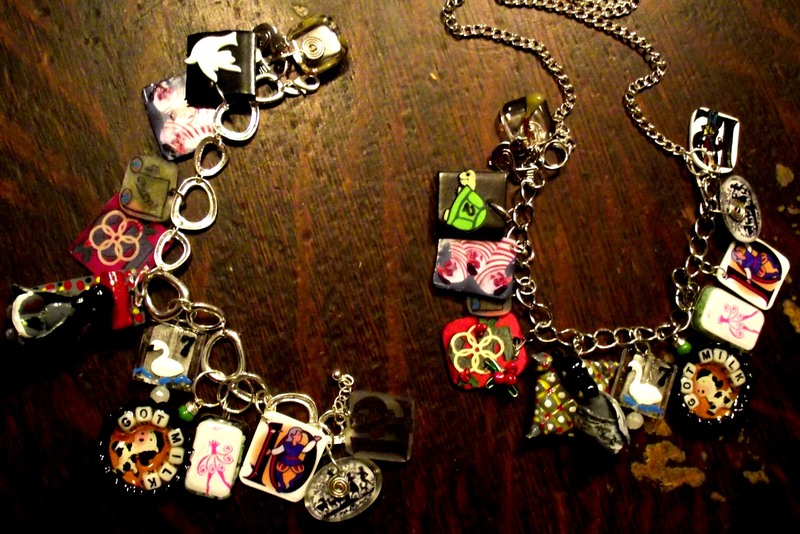 I incorporated my charms into a necklace. If you recall from the popular song, the first verse runs: on the first day of Christmas, my true love gave to me…a partridge in a pear tree and on the second day of Christmas, my true love gave to me…two turtle doves. Other mentions in the song and items included symbolically in the project are three french hens (ooh la-la), four calling birds (on cell phones of course), five golden rings, six geese-a-laying (comfortably on a pillow), seven swans-a-swimming , eight maids a milking (got milk? ), nine ladies dancing, ten lords-a-leaping, eleven pipers piping, and twelve drummers drumming. Gail happily organized twelve friends who agreed to share their skills and talents and come together to make and exchange their art projects. 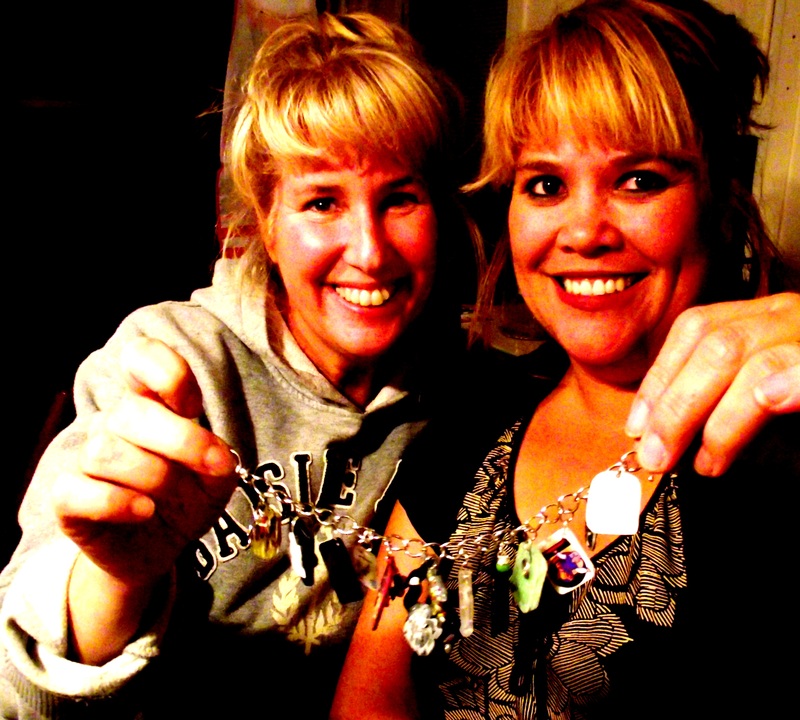 Today’s blog celebrates the creativeness of her group of friends. They held an initial meeting to brainstorm and decide on how they would start. The assignment was for each person to make twelve separate items all with the same likeness and theme based on the number picked that corresponded to the same numbers in the Christmas carol song: The Twelve Days of Christmas. The deadline was set and each member of the group went home ready to create their twelve items and return to share them. 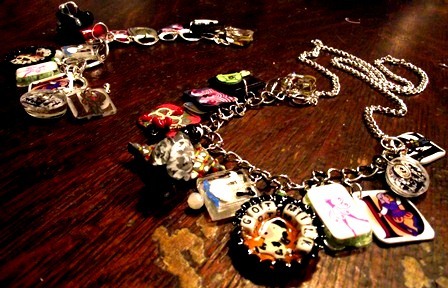 With all of the charms collected we were then free to add them to a bracelet and create our group project. We collected one work of art charm from each person. Our final products from the group project. Contributors in this artistic product were: Marki, Annette, Bri, Amanda, Donna, Melissa, Gayle, Chris, MellaDee, and myself. We shared time and talent, creating a meaningful item that will surely hold memories as well as appreciation for the creative process. We are now planning to get together to complete a Valentine theme bracelet. I feel another blog coming from that experience too for sure! To end this post, I’d like to share the idea that you may want to consider. Make your favorite bracelet serve you well with a double duty. Add an interesting dash of bling to your purse or bag with a closely related length of your bracelet size. Attach it to the top of the rim on both sides of your purse for a fun twist of fashion, and show off your creation! Consider this double-duty idea for your bracelet.